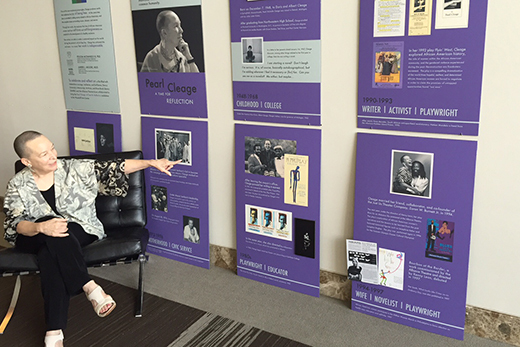 Playwright and activist Pearl Cleage sits with panels from her exhibit "Pearl Cleage: A Time for Reflection," shown earlier this year at the Alliance Theatre and now on display with "Revealing Her Story" on Level 2 of the Woodruff Library. Two exhibits featuring the stories of nine African American women intellectuals are now open on Level 2 of Emory's Robert W. Woodruff Library. "Revealing Her Story: Documenting African American Women Intellectuals" and "Pearl Cleage: A Time for Reflection," which offer looks into the collections of these distinctive women, are the culmination of a two-year processing project. The collections of the nine women – Pearl Cleage, Delilah Jackson, Samella S. Lewis, Almena Lomax, May Miller, Undine Smith Moore, Geneva Southall, Mildred Thompson and Sarah E. Wright – were processed with funding from a National Historical Publication and Records Commission grant. Amber L. Moore, a project archivist at Emory's Stuart A. Rose Manuscript, Archives, and Rare Book Library, and four graduate students worked on the collections. The team processed more than 270 boxes of materials that include correspondence, writings, compositions, photographs and audiovisual materials. Moore hopes that the exhibits will entice researchers to visit the archives to learn more about the lives of these extraordinary women and their contributions as artists, writers, educators, composers, musicians, educators, activists and more. "This project has been such a transformative and empowering experience for me," she says. "I've seen the ups and downs, struggles, triumphs, growth and accomplishments of other women of color through their own eyes. They are just like me. I have the remarkable job and responsibility to make sure that others have the same chance to be inspired." The exhibit panels provide details on the nine women, along with information on how to access EmoryFindingAids, the online collection inventories. The collections are accessible to researchers and the public by appointment at the Rose Library. "Revealing Her Story" was previously featured in Emory's Administrative Building and on the 7th floor of the Woodruff Library. "Pearl Cleage: A Time for Reflection" was shown earlier this year at the Woodruff Arts Center through a collaboration with Emory's Rose Library and the Alliance Theatre. That display coincided with the theater's production of "Blues for an Alabama Sky," a play written by Cleage, who is also a novelist and activist. The Cleage exhibit was co-curated by Moore and Pellom McDaniel III, curator of African American collections at the Rose Library. The exhibits are free and open to the public. Open during visitor library hours, they will be on view through Feb. 28, 2016.